“Boutade” – a sudden outburst or outbreak, from the french word “bouter” – to thrust. 1 – Preston Barracks: This has been approved and work has started on site. 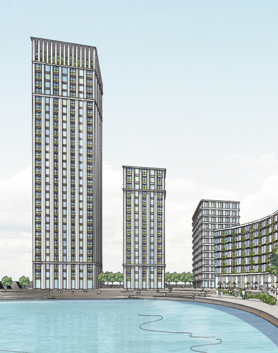 This development includes the following tall buildings: an 18 storey student tower block surrounded by seven student accommodation blocks of 9 storeys, two of 10 storeys, and others of 11,12, 13, and 15 storeys high. There are also residental blocks accommodating 369 flats up to 10 storeys high. 2 – Circus Street: Work is well advanced on this giant project – it is already towering high above the surrounding streets. Pity the poor residents of the Milner Flats just to the east of the site whose homes are dwarfed by the scale of the dense student housing blocks towering over them. 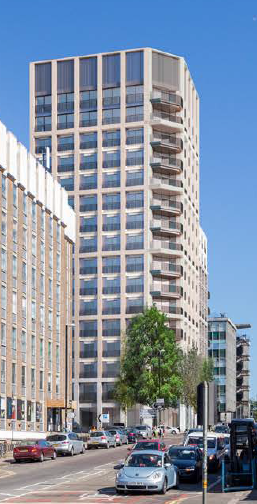 Included in this development is a 14 storey student accommodation tower, and a 10 storey residential tower in a major development where the other private and student residential buildings vary in height between 6 to 8 storeys. 3 – Anston House: this has three towers of 13, 14 and 15 storeys. This was approved over two years ago but the developers First Base, have not even started discussions with the Council on things like the Section 106 agreements and other planning conditions. Are they just sitting on it or using it as a land bank to shore up their financial balance sheet? 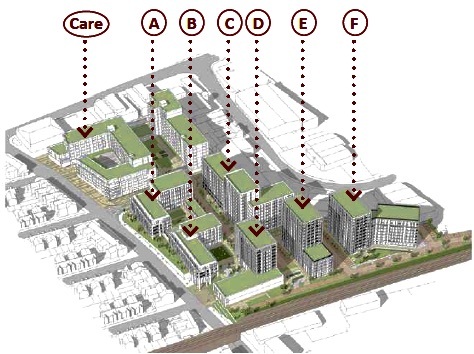 4 – Longley Industrial Estate, New England Road – mixed use development: 18 storeys. A planning application is in and awaiting decision. 5 – Vantage Point, next to the Longley Industrial Estate (above): 16 storeys. Preliminary proposals have been made public but no planning application has yet been made. 6 – Brewer’s site, New England Street: no proposals have been presented yet but we are expecting another tall building to be proposed for this site, very close to the two towers mentioned in 4 and 5 above. No doubt the developers will wait to see whether the Longley Industrial Estate application is approved before deciding on the height of the development on the Brewer’s site. 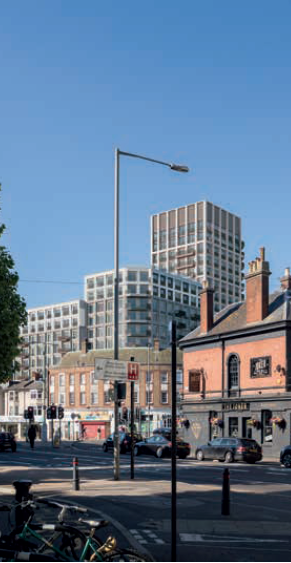 These three schemes will result in a tightly spaced conglomeration of tall buildings set on higher land just to the north of two of Brighton’s tallest churches – St Peter’s Church and St Bartholomew’s, vying with both for visual prominence. 7 – Peacock Industrial Estate, Lyon Close: A planning application has been lodged for this development which consists of a 10 storey block just to the north of Montefiore Hospital, as part of a major residential development which also includes other blocks from 5 – 7 storeys. 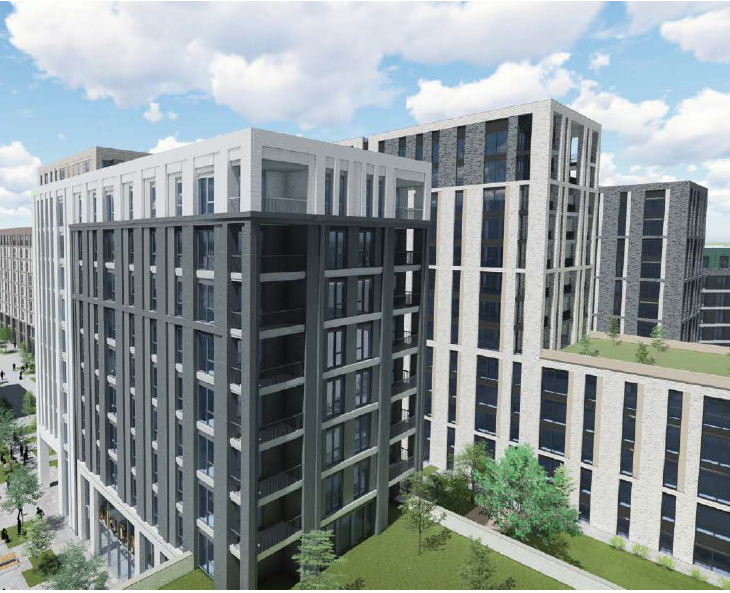 9- Sackville Trading Estate, Hove: Initial proposals were for several residential blocks varying between 11 – 16 storeys located just to the North of the railway line west of Hove Station. Following comments made at the first public consultation (including ones from us), the height of the 16 storey tower has been reduced. But there is still a massive conglomeration of tall buildings varying from 10 to 13 storeys high, which will have a major effect on the character of the Hove skyline and its relatively low-rise suburban character, as well as blocking the last remaining views of the sea from the locally listed Hove Park. If you are inclined to view the proposals on the Council website, the planning Ref is BH2018/03697. But be warned – there are 389 documents you will have to read. 10: All nine proposals listed above are in addition to the 28-storey tower at the Marina together with eight other tall blocks between 8 – 16 storeys high, all crammed into the same constricted site. A planning application is expected soon. Two of 8 or 9-storeys with curved facades facing south (see the image at left); at the western end of these is a 12-storey block; to the south of that is a 16-storey tower standing close to an even higher tower of 28-storeys; behind these just to the north, are one 10-storey block, 2 blocks of 12 – 13 storeys and another block of 16 or 17 storeys. That’s nine very tall and bulky buildings on an tightly congested site, all considerably taller than the top of the chalk cliffs behind. And whatever is permitted at the Marina will inevitably influence the height and scale of any future development on the nearby Black Rock site, particularly as, like the Circus Street and King Alfred sites, the land is owned by the City Council. 12. 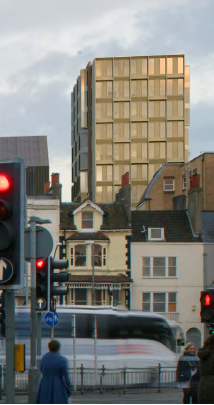 And there is more… a 17-storey building which is part of another high-rise conglomeration at Ellen Street just to the west of Hove Station may be approved. 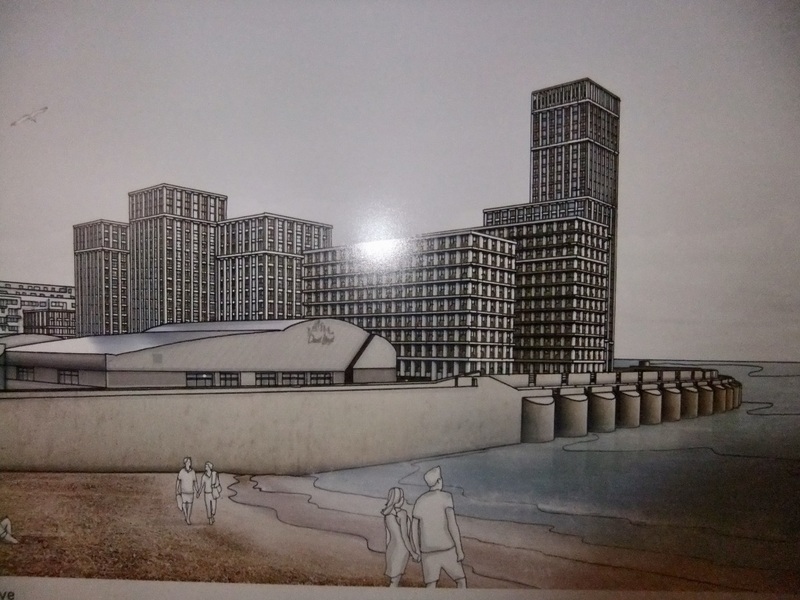 This was rejected by the Council back in June 2017, on the grounds of insufficient affordable housing, but the developers appealed – and with the support of the Hove Station Neighbourhood Forum and believe it or not, Brighton’s Conservation champion, the Regency Society, approval may well be granted on appeal. Tall buildings are generally bad news for our heritage and landscape. Gradually they begin to disguise the character of the city’s topography by intruding high above the skylines formed by Brighton’s hills and valleys which define the character and neighbourhoods of the city. And their sheer height and bulk will mostly have a detrimental effect on the character of Conservation Areas and other historic assets such as listed buildings. Brighton has 34 Conservation Areas, the vast majority of which are located in the central city. You could almost describe it a one single conservation area with a few holes in it. Tall buildings block views. For example the Newtown Road and Sackville Trading Estate proposals will block the last remaining views of the sea from Hove Park. And there are many areas all over the city where important views will also be badly affected by these conglomerations of tall buildings including those from the South Downs and higher areas around the city. Effect on the character of the city. The impact of so many conglomerations of closely packed tall buildings will have a detrimental effect on the existing character of the city as a whole. Perhaps it would be a bit unfair to say that Croydon has come to Brighton, but as most of central Brighton and Hove is effectively one big conservation area, and home to well over a thousand listed buildings, the value of its existing character and heritage is not something which can just be ignored. These major changes to the relationship between the city’s built environment and its landscapes and seascapes are happening by default – not because the people of Brighton have given their consent. 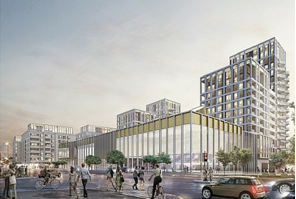 The massive scale and height of so many recently approved or proposed developments in the city described above are now changing the character of the city’s built environment in a significant and detrimental way. Council’s inability to control this situation. This process is being driven by developers’ awareness that the City’s planning system is defenceless because of its current inability to guarantee a five year housing supply. This lamentable situation is also fuelled by the lack of any Urban Design Frameworks which were intended to accompany the Council’s Tall Buildings Policy of 2004, which would have clarified and regulated an appropriate scale and character relative to the situation and settings of Tall Buildings proposals. Importance of Heritage and landscape. A vital part of the city’s heritage is its topography and landscape, just as much as its conservation areas and its world-class historical buildings. Our landscapes and seascapes, our hills, valleys and cliffs should dominate our buildings – NOT the other way round. Do we need to have tall buildings anyway? There is a myth that the city needs high rise buildings to provide the numbers of dwellings needed to meet the City Plan targets. The truth is they don’t actually add a lot to the City’s housing stock. For example, let’s say there will be 20 tower blocks, 15 storeys high built in the city over the next few years up to 2030 – the end of the City Plan period. 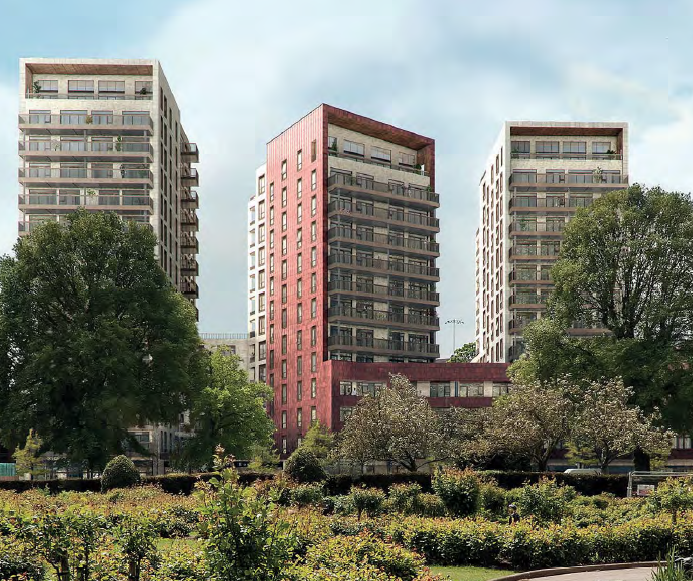 A typical tall building – say one of the three towers in the Anston House scheme – would have three flats per floor. So five storeys would have fifteen flats – the difference between a ten storey building and a fifteen storey building. So let’s assume that 20 fifteen storey buildings are built between now and 2030 (the end of the City Plan period). If each of these was ten storeys this would result in 300 fewer flats than ones 15 storeys high (15 x 20 = 300). This is a drop in the ocean compared with the figure of 13,200 new dwellings required in the city – less than 2.3% of the total. Tall buildings are not necessary to provide the numbers – increasing the density of the City Plan assumption of 50 dwellings per hectare (dpu) to 55 or 60 dpu elsewhere in city such as the fringe sites, would provide far more houses of the type actually required in the city. 47% of the city’s housing requirement is for 3 – 4 bedroom homes – how many of these are being provided by a relatively small number of expensive flats on the upper floors of tall buildings? Over-concentration on high rise developments does little to help families – but it could help wealthy investors based overseas, prospective second home owners and landlords who want to charge high rents for wealthy tenants – very few if any of whom need that help. Developers of course prefer to sell to the high end of the market. The traditional pattern of development in the central areas of Brighton and Hove is for high density, relatively low rise terrace type housing exemplified by its Regency terraces at one end of the spectrum or the tightly packed streets of Hanover at the other. Both of these housing types can create very high densities which would, if replicated in new developments, easily provide the numbers of extra dwellings required by the City Plan – but without building tall blocks. Let’s make an effort to preserve that tradition. From every point of view tall buildings are bad news. As well as the drawbacks referred to above, social commentators have highlighted loneliness and the lack of any real sense of community is all too common within tall buildings. Yet again we emphasise that high densities don’t have to mean high rise. Will our city planners ever learn that lesson?